Venus' southern hemisphere, as seen in the ultraviolet. In about three weeks, we will lose a brilliant luminary that has been so much a part of our evening sky since the end of last summer. The planet Venus, which shone so high and bright in the western sky during February, is now moving steadily lower with each passing night; it has begun its plunge down toward the sunset, soon to make its most dramatic exit from the evening sky since 2001. Currently Venus is setting just under three hours after the sun in a dark sky. You can't miss it. Simply go out just after sunset and look West. By March 12, Venus will follow the sun by only about two hours and on March 21 by just an hour. And by March 25 it will lie only 9-degrees to the upper-right of the setting sun (your clenched fist measures roughly 10-degrees at arm's length) and follows it down by only about a half an hour. The reason for Venus' rapid fall toward the sun is that the planet will pass inferior conjunction on March 27. That means Venus, which orbits the sun well inside Earth's orbit, will be between us and the sun [Video]. The setup causes Venus to go through phases, much like our moon. For several weeks before and after March 27, Venus is relatively close to Earth, and its thin, backlighted crescent becomes large enough to resolve in steadily-held 7-power binoculars. The planet's narrowing crescent is best seen right around sunset or in bright twilight when a bright sky helps to reduce the planet's brilliant glare. As it swings close to Earth in the coming weeks it will grow to nearly 1/30 of the apparent diameter of the Moon -- a waning crescent visible with telescopes, binoculars, and just possibly even with the naked eye. But the crescent is also thinning, so its magnitude fades during the month from -4.6 to -4.0. In daylight, with a telescope and really clear, steady air, you might even observe the cusps of the crescent extending all the way around to form a ring. This effect results from sunlight diffused and scattered through Venus' upper atmosphere. 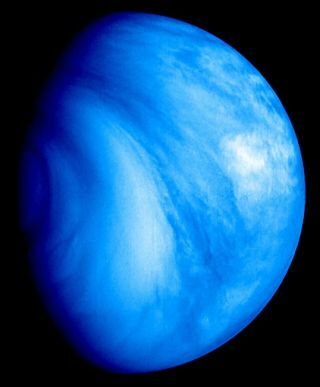 On March 6, the disk of Venus is 14-percent illuminated, but by March 21 the planet will have grown 16-percent larger while its phase will have thinned to a striking 2-percent. By March 25, look for it to twinkle in the twilight because its crescent is so thin! A telescope will reveal it to be a hairline sickle by then, only 1-percent sunlit. Venus goes through an eight-year cycle of apparitions, meaning its behavior this year closely duplicates that in 2001, 1993, 1985, and on back. And only once per cycle do we in the Northern Hemisphere get a brief window of opportunity to glimpse Venus both at dusk and dawn on the same day. This happens because at this particular apparition Venus passes widely north of the sun at conjunction, so observers at mid-northern latitudes can pick it up as a morning object before it disappears from the evening sky. We'll have more to say about this in Night Sky next week, so stay tuned!